GlucoFit™ | Banaba-Based Anti-Diabetes Supplement | Get Here! Controlling blood sugar is essential. Glucose that is not transported into cells stagnates in the blood and is often converted into fat. Elevated blood sugar levels not only lead to weight gain but also to glycation, a specific type of damage caused by a reaction between glucose and protein, as well as to other common diseases such as atherosclerosis. In human studies, Glucofit™ reduced blood sugar levels in non-insulin dependent (Type II) diabetics. In animal studies, it lowered blood glucose in both diabetic and healthy animals. In fact, studies show that Glucofit™ is the most effective nutritional supplement for controlling blood sugar. Recently-published preliminary results of a comparative clinical study show that patients supplemented with the new Glucofit™ for 60 days lost over 4.5 kg, including 70% body fat mass, while those supplemented with the original Glucosol™ lost only' 3 kg. These results would seem to confirm the dose-dependent efficacy of corosolic acid in weight control. Other ingredients: rice bran oil, glycerine, concentrated carob extract, beeswax, silicon dioxide, titanium dioxide. Glucofit™ - Softgel. — GlucoHelp™ - Kenko/Chemco Corporation. Adults. Take one softgel every 12 to 24 hours or according to the advice of your therapist. Glucofit™ is remarkably free from contra-indications and side-effects. It should only be avoided by those predisposed to hypoglycaemia, to prevent an excessive drop in their blood sugar. 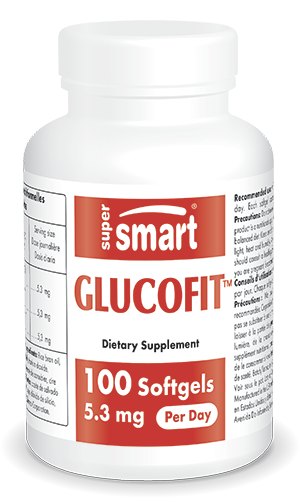 Each softgel contains 2.65 mg of Glucofit™.